This step in the process uses the data capability assessment to determine your organisation's current level of data management maturity. Assess the data which powers your institution. Consider only structured data, but not just student data. It’s important to include finance, HR, estates, etc. Each question assesses one of four ‘blocks of maturity’: people and culture, business process, data activities and technology. Choose an answer from the assessment that best represents the overall institutional fit. The five answers represent the capability levels: chaotic, predictive, stable, proactive and predictive. No formal data management capability exists. Data is collected, stored and processed in an entirely operational context. Business processes are embryonic at best, while technology is very limited in use. Dealing with operation and change is difficult and quality of outputs is not trusted. Culturally data is not viewed as important, or even understood. There are no repeatable processes to increase efficiency or reduce cost, no interest in dealing with potential legal data breaches, and no strategy or direction on how data management can support organisational goals. A nascent data management capability is emerging. Known outputs are supported by informal roles and simple business processes.Technology may be providing some point solutions. Change is still difficult to deal with but some trust in quality of key outputs is likely. The value of data is not likely to be well understood or advocated by non-IT staff although the value of outputs – especially statutory – obligations will be. There will be no real support for a data improvement plan or devolution of information accountability. A lack of data governance still puts the organisation at risk and a root cause analysis will continue to make maintaining quality problematic. Data management is embedded for key datasets and statutory outputs. 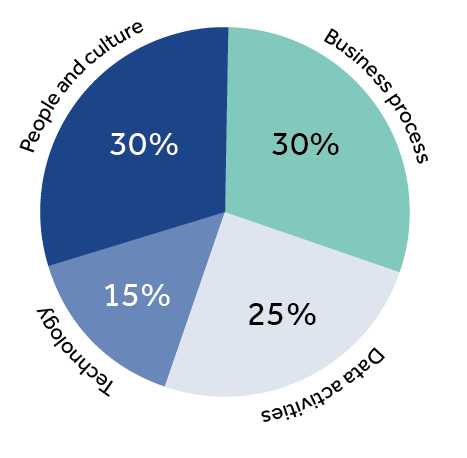 Roles have emerged and business processes reduce reliance on individuals. Data quality measurement will be patchy, focused on where information asset accountability has been devolved. Technology is likely to support some parts of the lifecycle. The value of data is likely to be championed in sections of the organisation but it will not have senior management interest except during periods of crisis. There is likely to be a push for the ‘single version of the truth’ but this is very difficult to achieve at a stable level because of the lack of reconciliation of data sets that ‘have gone wild’. Data management is a key organisational capability. The majority of outputs are automated and supported by rigorous and integrated business processes. Capacity for business change is available and likely delivered through some form of data architecture function. Services such as analytics are likely to be available or emerging as part of a technology set that is integrated with wider toolsets. Data and the value of it will be championed by at least one senior stakeholder and improvement plans will be embedded as part of daily operation. Data governance is likely to be formalised providing far greater control over the quality and mastering of core datasets, and data management roles are likely to be formally defined. Data management has morphed into a strategic capability. It is the foundation for the development of new and innovative services of which predictive analytics and sophisticated data linking are just two. Automation of all repeatable business processes will be seamlessly integrated with business process and wider organisational operating models. Data architecture will be fully fledged creating enterprise wide conceptual models as part of creating new and upgrading current services. Technology will support operations and change as part of an integrated package of solutions. Complete the maturity assessment spreadsheet. Record your maturity level with any observations. Use the characteristics query tool to confirm this is the level your institution is operating at. It might be useful to copy and paste the analysis into your improvement plan to explain how the score was arrived at in more detail. Provide examples of where the answers to the questions – especially the low scoring ones – relate back to your collection of data issues completed in the previous section. While each organisation’s assessment will result in a different score, the average for the sector based on over a 100 analysed assessments is a level Reactive (see the report Data Capability – a call to action).